The English Department offers several awards and prizes for exceptional work in English. All include cash prizes and recognition at a formal ceremony. 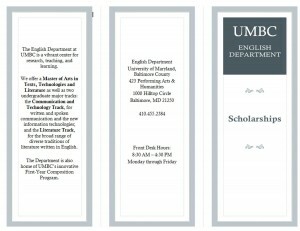 The Robert G. Shedd Award will be given annually to a UMBC English major for Excellence in English. The student is selected by the English Department faculty. Selection is based on grade point averages in all courses, but especially in English, and consideration of any substantial scholarly or creative work. Candidates for this award should have a 3.5 GPA or better. The Journalism Prize recipient is determined by the Retriever faculty advisor. The UMBC student’s name, along with the rationale for the nomination, is submitted then ratified by the English Department faculty. The Outstanding Contributions in English Award recipient is selected by the English Department faculty. The selection process is based on a academic record, service to the department, and work done in areas that are not graded. Candidates for this award should have a 3.5 GPA or better. The Malcolm C. Braly Creative Writing Award was established to honor the memory of Malcolm C. Braly, who was a member of the UMBC English Department until his death in 1980. Awards are made in fiction, poetry, and creative nonfiction. Submissions for the Braly Awards may be made through a faculty member or directly to the English Department office, and all submissions to UMBC’s creative arts journal Bartleby that are received by the journal’s December submission deadline are automatically considered for the award, regardless of whether they are selected for publication in Bartleby. The deadline for submitting work to a faculty member or to the English department office is February 15th each year, and can be submitted on paper or via email as a Word document attachment. Each submission should have a cover sheet with the author’s name and contact information. Names should not appear on any other page. Entries must be double spaced, although poetry may be single-spaced. Poetry submissions should include no more than four poems; fiction should be no more than thirty pages in length; and drama should be one act or longer. The entries are judged by a committee of English Department faculty. The Barksdale Scholarship was established to pay tribute to Richard K. Barksdale, the second African American to receive a Ph.D. in English literature from Harvard University. Recipients of this award will be UMBC English majors entering their junior year who have at least a 3.2 GPA and who have demonstrated a commitment to the advancement of minorities in the field of English. The Barksdale Scholarship will consist of $500 per semester in tuition support for one academic year. If the candidate is already fully supported, the award will be $500 in cash as well as institutional recommendation for graduate study. The Ford Scholarship was established in memory of Nick Ford and as a tribute to Ola Ford. Professor Ford received his Ph.D. in English from the University of Iowa and served for many years as Chair of the English Department at Morgan State University. 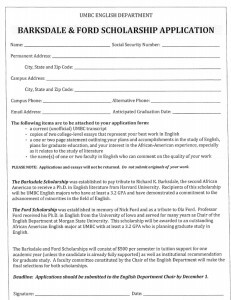 This scholarship will be awarded to an outstanding African American English major at UMBC with at least a 3.2 GPA who is planning graduate study in English. The Ford Scholarship consists of $500 per semester in tuition support for one academic year. If the candidate is already fully supported, the award will be $500 in cash as well as institutional recommendation for graduate study. Students who meet the eligibility requirements for The Barksdale Scholarship and The Ford Scholarship are welcome to apply for both. Applications should be submitted to the Chair of the English Department by December 1. Click here for additional information about the English Department’s Scholarships. Click here for the Barksdale Scholarship and Ford Scholarship application.